As Americans feel the financial pinch, they're looking for ways to cut corners. As fewer Americans choose to dine out, or dine out less often, restaurants are seeking ways to promote their establishments and provide better value for their customers. Restaurant.com has been connecting restaurants and diners nationwide since 1999. They're bringing people together to relax, converse, and enjoy well-prepared meals at affordable prices. Join the Restaurant.com customers who have saved more than $100 million through the gift certificate program. Browse the 15,000+ restaurants nationwide, then learn more about them by viewing their websites with menus, wine lists, photos, chef's backgrounds and more. When you find a restaurant you like, Restaurant Gift Certificates are available for a fraction of the actual value. Restaurant.com makes a night out on the town a lot easier on the wallet, and Gift Certificates are an excellent gift for any occasion. 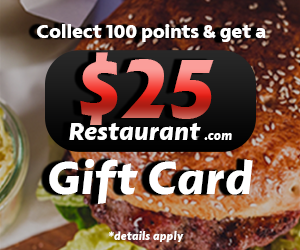 Click to be rewarded with a $25 Restaurant.com gift card when you collect 100 points.